To edit photos in Photoshop Elements, you need to download your images from your camera to your computer’s hard drive and then import photos you want to edit into the Photoshop Elements Organizer. Insert a media card from a camera or attach a camera to your computer via a USB port. It’s better to use a media card instead of attaching your camera, in case the battery is low on your camera. (If the battery runs out, the import stops.) If you have a media card for your camera, take it out and insert it into a card reader that you attach to your computer via a USB port or a built-in card reader in your computer. If you see an Autoplay Wizard on Windows or a dialog box for importing photos into iPhoto on the Mac, cancel out of the dialog box and let Elements control your import. In Elements, open the Organizer workspace and choose Import→From Files and Folders, or choose File→Get Photos and Videos from Camera or Card Reader, or press Ctrl+G (Cmd+G on the Mac). 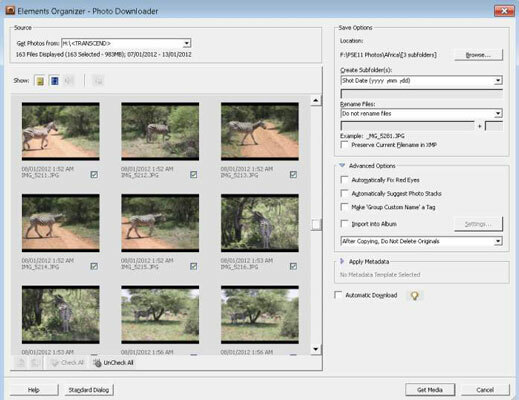 The Elements Organizer – Photo Downloader opens, as shown in the figure. In the Photo Downloader, open the drop-down menu at the top of the dialog box and choose your media card. Click the Browse button and locate the folder on your drive to which you want to copy the photos. If you don’t click the Browse button and select a folder, all files copied to your hard drive are copied to the User Pictures folder. This is the default for Photoshop Elements. If you use an external hard drive to store your photos, you’ll want to copy photos to the external drive. When you select a folder, select the one that fits the overall folder organizational structure for your images so your image files stay organized. Leave the rest of the settings at the defaults. Don’t rename the photos here. You can take care of file renaming in the Organizer later. Don’t delete the photos from your card just in case you delete some photos in the Organizer and want to retrieve them. After you’re certain everything in Elements is to your liking, you can later delete photos by using your camera. There’s an Advanced dialog box for the Downloader that you access by clicking the Advanced Dialog button. In the Advanced settings, you can make choices for things like correcting for red-eye, creating photo stacks, and editing photo data, called metadata. Because you can handle all these tasks in Elements, just leave the Advanced settings at their defaults. Import photos by clicking the Get Media button in the Photo Downloader dialog box. Elements adds the photos to the Organizer, and you eventually see thumbnail images in the Organizer’s Media Browser after the upload is completed.